Police detained two armed assailants who entered an office of the ruling AK party in Istanbul on Wednesday, a day after a fatal hostage shootout incident. Later in the day, two attackers were reportedly shot by police near Istanbul police headquarters. 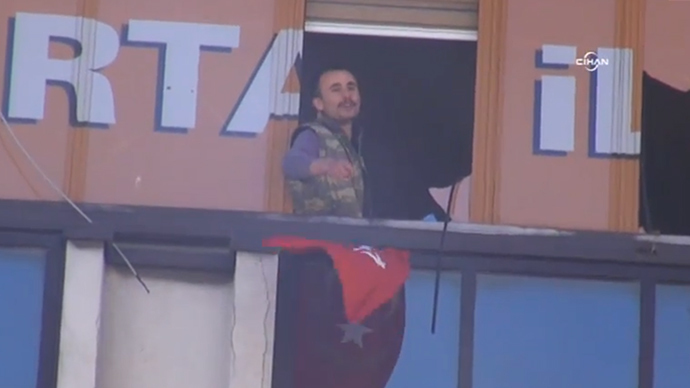 As was seen from the pictures and a video posted on social media one person broke the glass in two windows on the top floor of a seven-story building occupied by the AKP party and hung a banner resembling the Turkish flag outside. It was not immediately clear how many people were inside the building. The two men ordered all those inside to leave. One of the armed assailants addressed the crowd gathered around the building from the window. Police sealed off the road around the building in the Kartal district of Istanbul’s Asian side. The tense situation took place just one day after a fatal shootout involving special forces and a prominent Istanbul prosecutor at one of the city’s main courthouses, which was taken over by a far-left terrorist group. Later on Wednesday, another attack was reported to have taken place near the main Istanbul police station. A person was reportedly seen lying on the ground outside the building following an apparent attack, Reuters reported, citing Turkey's Dogan news agency. Gunfire was heard, and all units were on alert, an official at the police headquarters told Reuters. Two attackers were shot by police in the incident, CNN Turk reported. Police neutralized the attackers, Turkish Haberturk channel reported, cited by TASS, saying one of them was shot dead. Two policemen were injured in the incident. The attackers - reportedly a man and a woman - approached a checkpoint of the police headquarters and opened fire on law enforcers. The shootout was reported, and the area was completely sealed off by the authorities. Hundreds of mourners gathered at an Istanbul mosque on Wednesday, to pay their respects to a prosecutor, identified as Mehmet Selim Kiraz by Turkish media. The prosecutor was taken hostage by a far-left group and was shot in the head during a police shootout on Tuesday. Turkish Prime Minister Ahmet Davutoglu and a former Turkish president were among those who attended the funeral, AP reported.